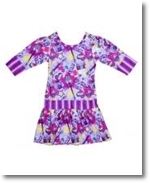 When choosing nightgowns for girls, there are a couple of things or considerations to keep in mind; at the top of the list will be the design or pattern. 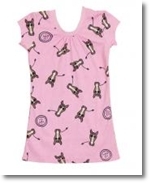 Depending on the age of the girl, the color or popular character printed on the nightgown or girls sleepwear will be of the utmost importance. Why? Because if she doesn't like it she'll avoid wearing it. The younger the girl, the more likely that a pink or purple nightgown will be a favorite, for example. Popular TV and movie characters also excite little girls into putting on their nightgowns at bedtime, when it otherwise may be a point of struggle between parent and child. 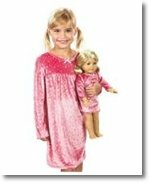 Nightgown and sleepwear manufacturers frequently license the images of the most popular toys, games and characters, with the express purpose of coaxing the parents into purchasing a bit of peace at bedtime. 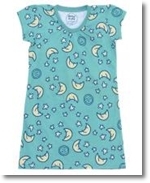 Licensed nightwear is a novelty that also makes a good gift, especially for the little girl who has everything. And, most parents will find that not until girls are nearly adults do they actually tend to choose fabrics wisely for cold or heat. 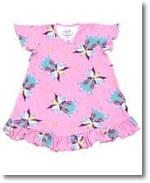 Luckily, when it comes to nightgowns for girls there are many fabrics and styles available in a great range of popular patterns and cartoon characters. In the winter it's best to buy fleece and flannel sleepwear. These fabrics are excellent choices, and are readily available in stores a few months ahead of the winter season. Girls enjoy "footed" nightwear in very cold weather, though it's good to note that the feet can become hot in the middle of the night, especially when the blankets are heavy. Girls still enjoy romping around in footed nightwear before bed, even if before getting under the covers, she changes to something more practical for sleeping. Footy pajamas and sleepers are usually made of fleece, though sometimes breathable cotton styles can be found. They cover the whole body from head to toe, and expose only the head, neck and hands. Zippers go up and down the front. These are a favorite at slumber parties. For summer months, there are cotton tank top and tee shirt styles that come with shorts. Some come in sets where all pieces can be mixed and matched together. Girls also especially like wearing "nighties", particularly in the summer months when the legs can go bare. Nighties and nightgowns can be short or long, without much change to comfort. Comfort may be the biggest consideration for the parent, if not for the child. Making sure that a little girl's sleep is not interrupted by itchy tags or stiff fabric, will be a priority. Trusted brands that use softer fabrics like cotton, and fleece ensure that she'll be comfortable and tender skin won't be scratched or irritated. Nightgowns for girls can be purchased in sizes a bit bigger than the girl's current size, allowing some extra time for her to wear the item before she grows too big for it. It's also important to note that for younger girls and babies, there are also safety issues involving nightwear and girls nightgowns. The most current recommendations for babies tend to change, but parenting websites are a good resource for the most current safety information. In addition, the state of California for example, requires nightwear to be treated with a fire resistant chemical. One last thing - if a nightgown is weather appropriate, and the style makes her smile, it may be a good idea to stock up on multiple versions of the same favorite item. It's good to have several choices of girls nightwear for each season.